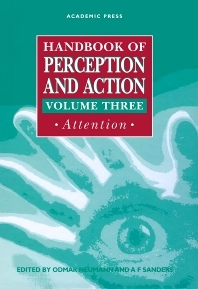 The Handbook of Perception and Action overviews state-of-the-art research in these two areas, while also stressing the functional relationships between them. The three-volume set will be useful toresearchers, technicians, graduate students, and final-year undergraduates in psychology, developmental psychology, speech and hearing, neuropsychology, neuroscience, and physiology. Researchers, technicians, graduate students, and final year undergraduates in psychology, speech and hearing, developmental psychology, neuropsychology, neuroscience, neurobiology, and physiology. A.F. Sanders and O. Neumann, Introduction. A.H.C. van der Heijden, Visual Attention. A.F. Sanders and M. Donk, Visual Search. G. ten Hoopen, Auditory Attention. M. Eimer, D. Nattkemper, E. Schriger, and W. Prinz, Involuntary Attention. G. Underwood and J. Everatt, Automatic and Controlled Information Processing: The Role of Attention in the Processing of Novelty. M.W. van der Molen, Energetics and the Reaction Process: Running Threads Through Experimental Psychology. A.A. Wijers, G. Mulder, T.C. Gunter, and H.G.O.M. Smid, Brain Potential Analysis of Selective Attention. O. Neumann, Theories of Attention. Chapter References. Subject Index.